My husband Scott is great in the kitchen. 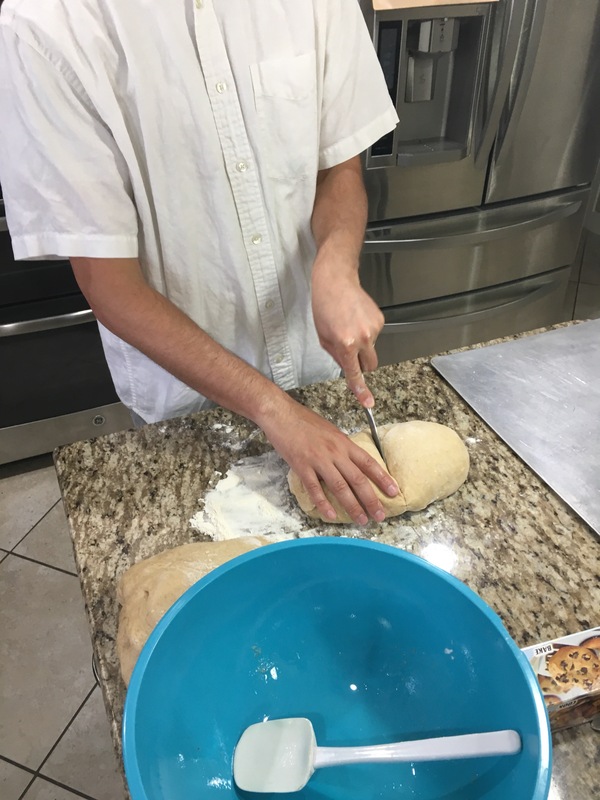 Not only can he follow a recipe, but he can also create some amazing things on his own. He served a two year mission for The Church of Jesus Christ of Latter Day Saints, and while there, he and his companion cooked pasta dinners with sauces almost daily for dinner, so he can make some great sauces and he’s amazing at knowing which spices go well together :). 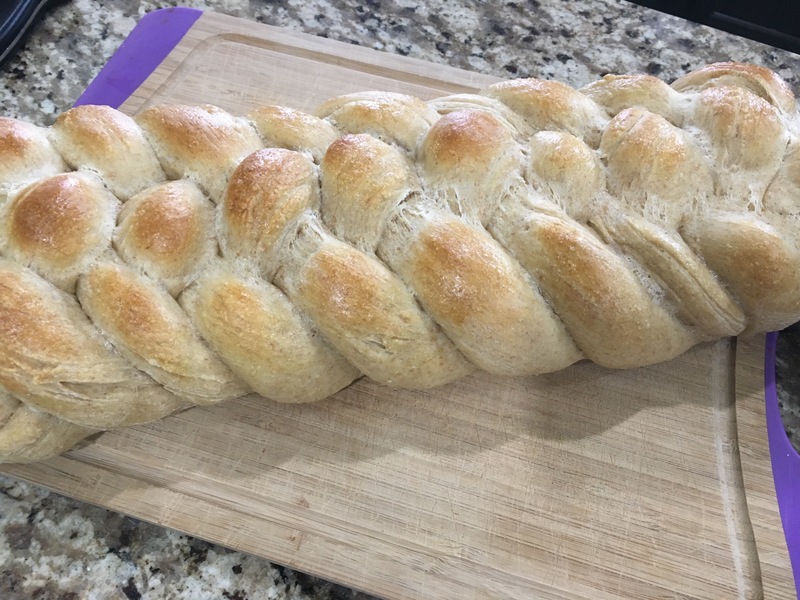 Now, I’m not sharing any of his sauce recipes today, but I am going to share a Challah Bread recipe that he has made his own and which we LOVE and have asked him to double so that we can make one loaf into French Toast and snack on the other loaf :). We have breakfast for dinner, once a week, on Sundays, and he will make this recipe one Sunday a month and it’s something we look forward to. 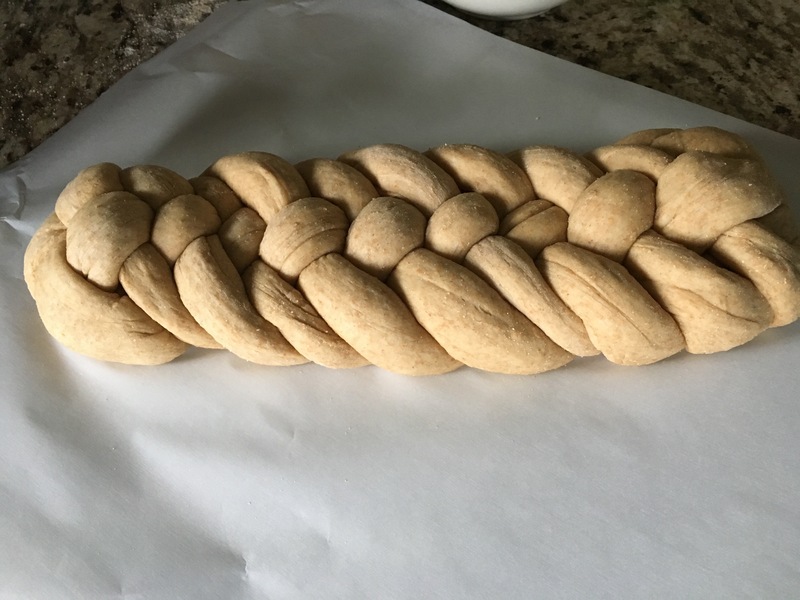 Since we double this recipe to make two loaves, after the dough has risen, we split the dough in half, braid one, then braid the other. 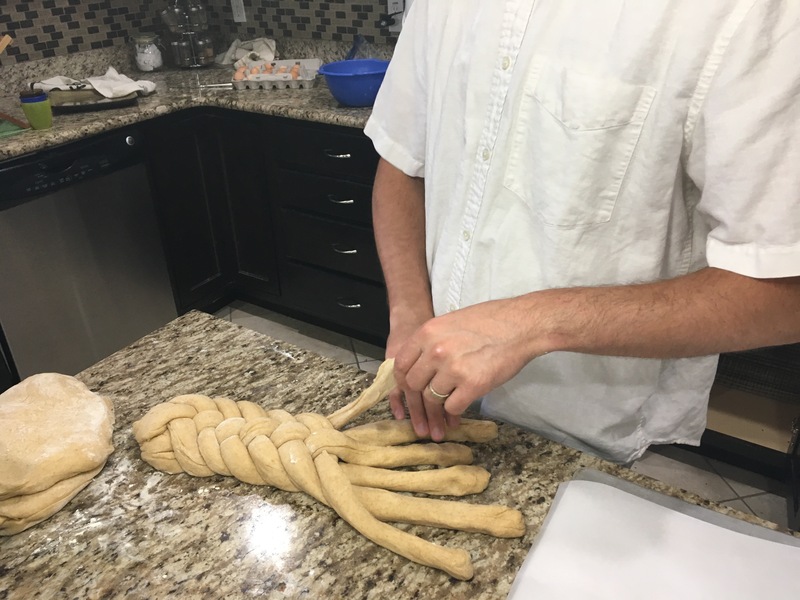 Sometimes Scott will take 2 of the 6 ropes (or 1 of the 3), and rub it with butter and roll it in cinnamon before he braids it. Yum! Nora brushing the bread with our egg white wash. And normally we’ll fit both loaves on this large cookie sheet. Sprinkle the yeast over the water in a small bowl and add a pinch of sugar. Stir to dissolve the yeast and let stand until there’s a frothy layer across the top. Set aside. In a standing mixer with dough hook attachments (we use our Bosch), combine 4 cups of flour, sugar and salt. Add the eggs, yolk and softened butter and mix. Pour the yeast over top. Knead with dough hook for 6 minutes(or knead by hand for 10 if you don’t have a stand mixer). If dough is very sticky, add flour, a teaspoon at a time until it feels tacky. The dough is finished kneading when it is soft, smooth and holds a ball shape. 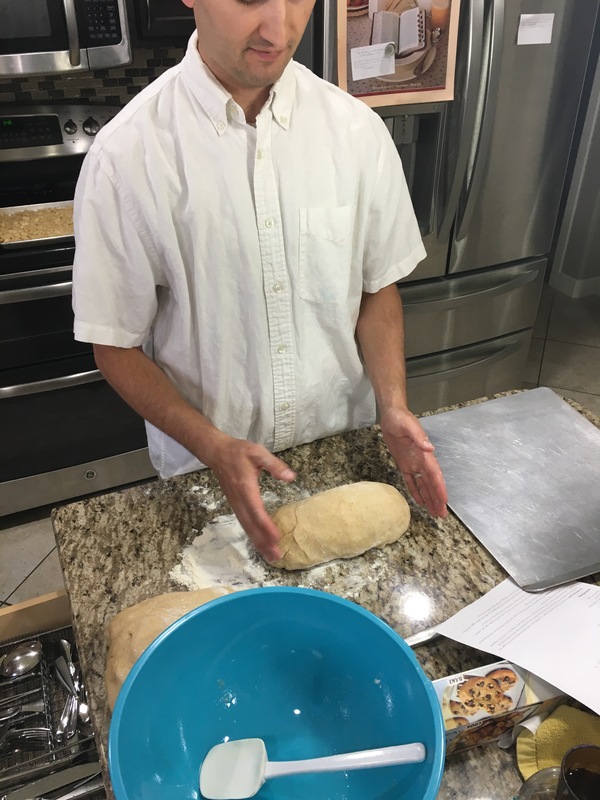 Place the dough in an oiled bowl, cover with a clean kitchen towel in a warm area (we wrap a towel under and over and set it on our counter). Let rise until doubled about 1 1/2 hours. Preheat oven to 350 degrees. Separate the dough into 3 to 6 equal pieces for braiding. 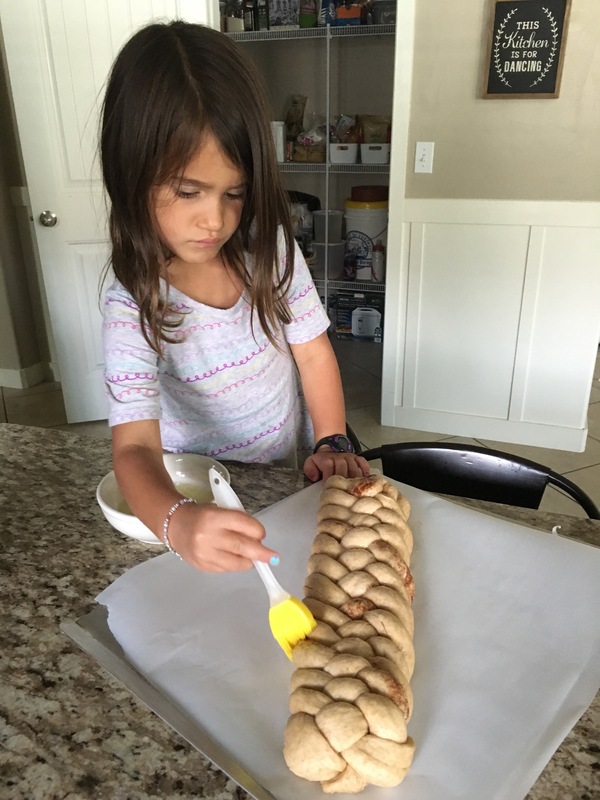 Roll each piece of dough into a long rope, about 1-inch thick and 16 inches long. Gather the ropes and squeeze them together at the very top. Braid the ropes together. Line a baking sheet with parchment and lift the loaf on top. (If you have the time, you can certainly allow this to rise a second time, which you would do right now. But it’s not necessary, we almost never have time to do a second rise and it turns out beautifully, just as pictured). Whisk the egg white with a tablespoon of water and brush it all over the challah. Be sure to get in the cracks and down the sides of the loaf. 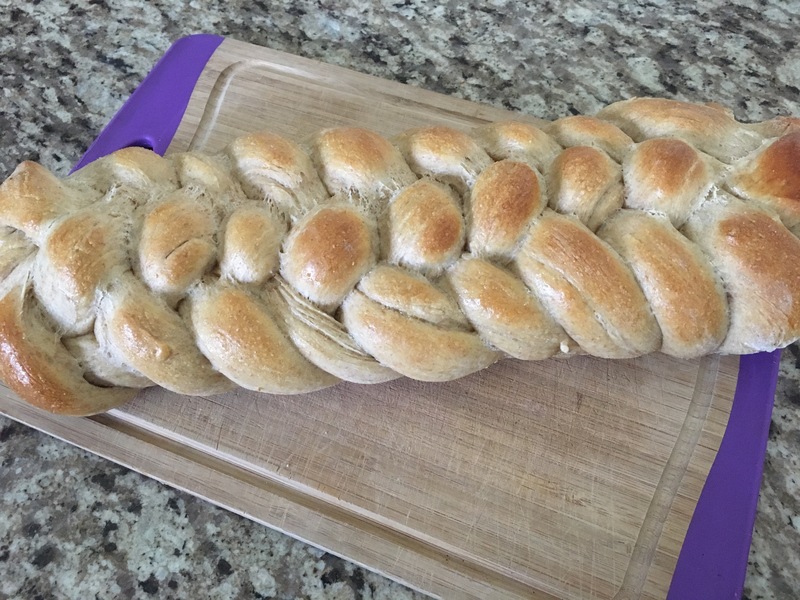 Put in oven and bake for 30-35 minutes, challah will be browned. Cool on a cooling rack until just barely warm, slice and eat. *We like to double this recipe and snack on one and cut the other into thick slices for French Toast. 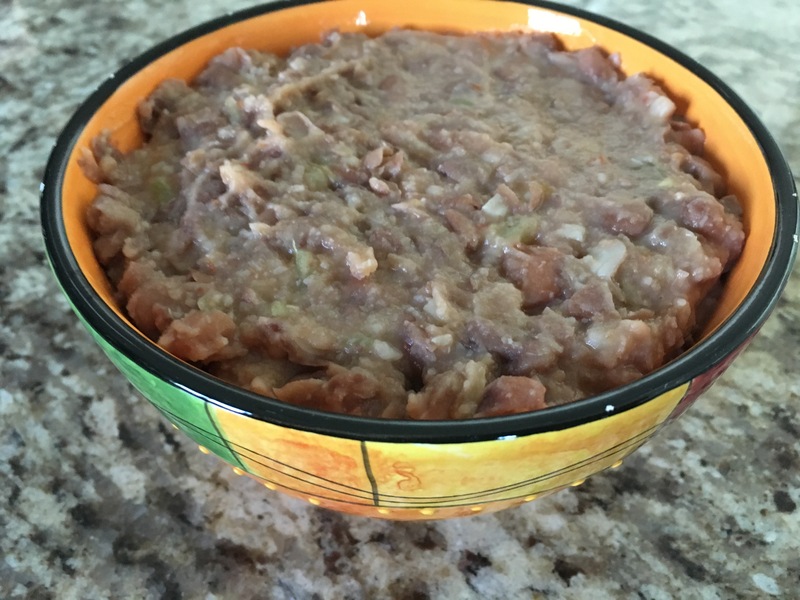 Growing up with a father who was born and raised in Mexico, we ate Refried Beans and Mexican Rice almost daily. And that’s not an exaggeration. As I’ve gotten older, my body can’t handle all the oil and just fried food in general, and this recipe has none of that but is still so yummy! This recipe comes from my sister, who gave me permission to share it with you here. 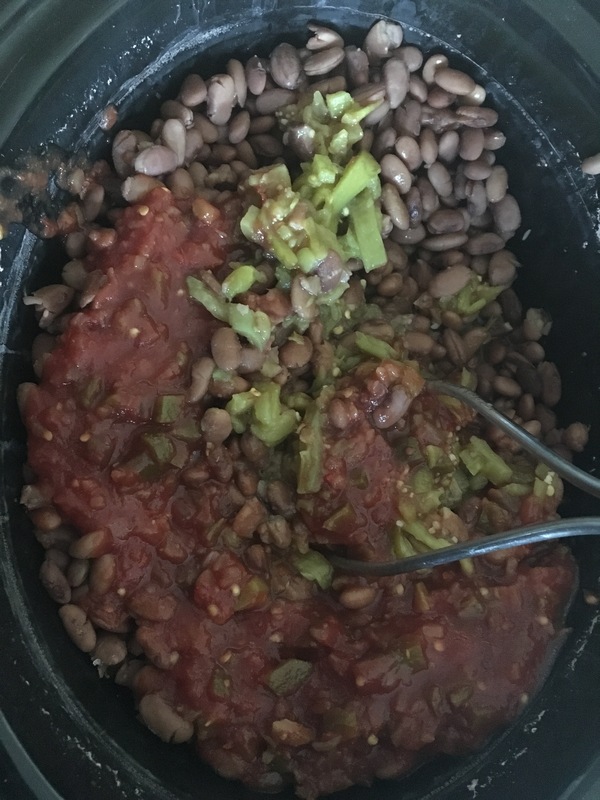 As I mentioned these ‘refried’ beans are really not fried at all, but instead you cook the beans in water in a crock pot for 5 hours, drain them, then add some salsa, diced chiles, and spices and mash them up and they’re ready to eat! Delicious and nutritious! 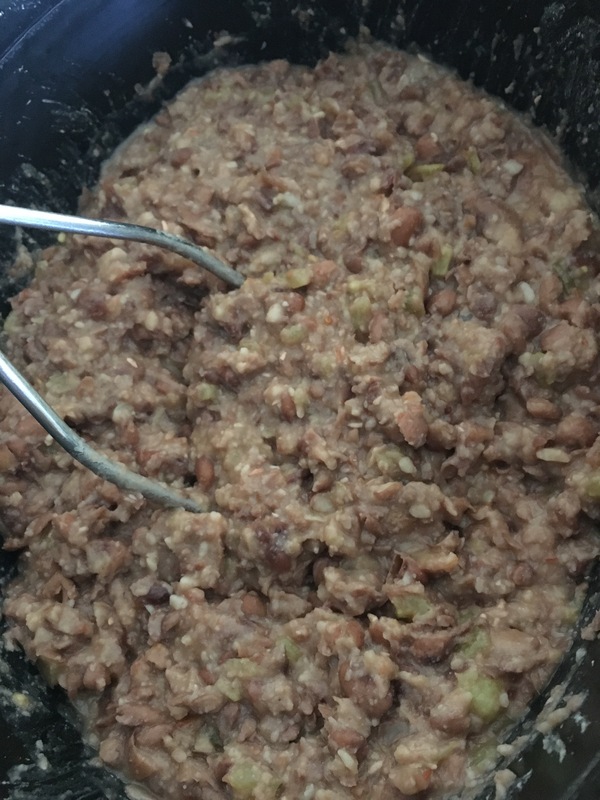 I like to use as few dishes as possible, so I cook the pinto beans in the crock pot, drain them in the sink (I don’t even use a strainer to save on dishes; it’s okay if there’s a tiny bit of water left in there), and then I dump all the other ingredients into the crock pot with the cooked beans and mash them with a potato masher. We love to eat these beans with enchiladas, or inside burritos, or on the side of any Mexican dish. It’s also a great chip dip! Enjoy! 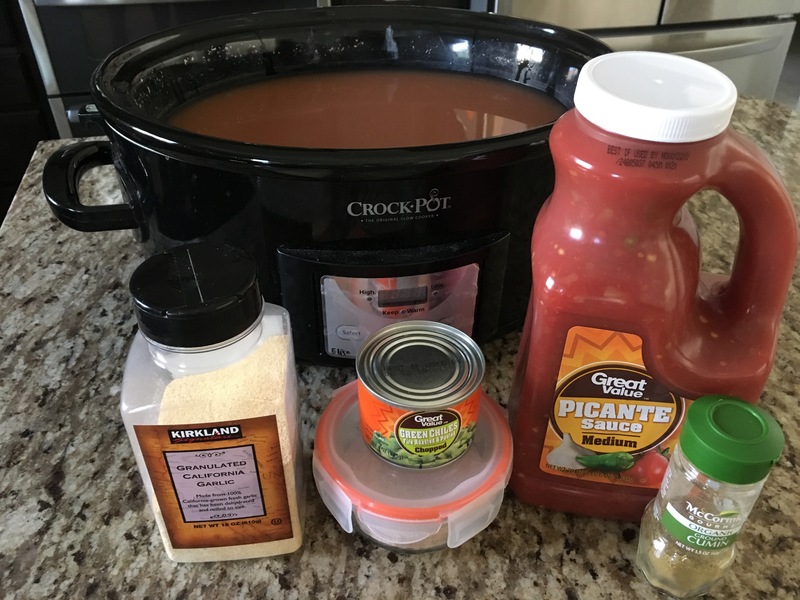 Put beans in a large crock pot and fill with cool water. Cook on high for 5 hours until soft. Drain beans and put back in crock pot(if you strained them in a separate dish). Add all of the other ingredients and mash with a potato masher until desired consistency. 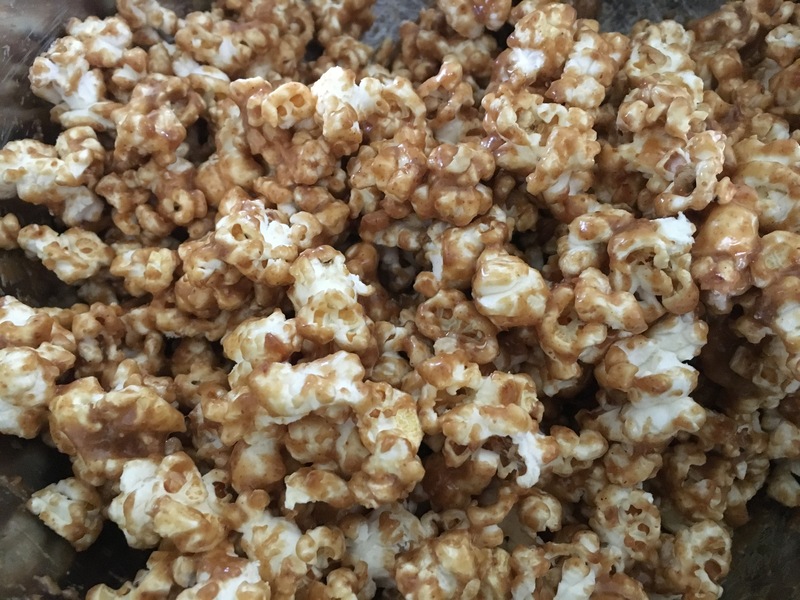 First you’ll want to get out get out a large mixing bowl and either make your 1/2 cup, plain, air popped popcorn, or measure out 10 cups of Original flavored SkinnyPop. Set the popcorn aside. Next you’ll want to add your coconut sugar and honey to a medium saucepan over medium, to medium-high heat. Stir this mixture together and once it comes to a soft boil, set your timer for 1 minute and allow it to boil while you’re continuously stirring. Once the timer rings, remove it from the heat and add in your peanut butter and quickly stir until they’re melted together. 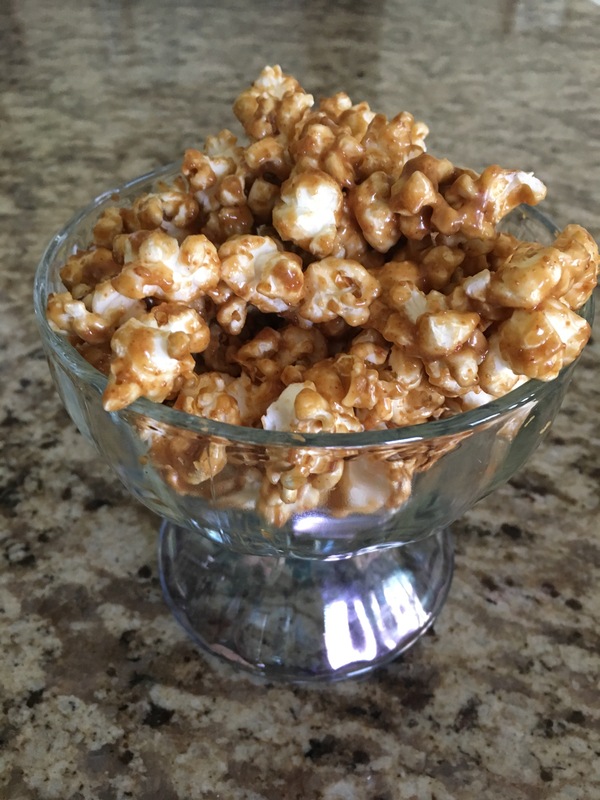 Immediately pour this peanut butter and honey mixture over your popcorn and stir until everything is combined and evenly coated. And that’s it! In a large mixing bowl add 10 cups of popcorn. Set aside. In a medium sauce pan, stir together coconut sugar and honey over medium to medium high heat. When it comes to a soft boil, allow it to boil for one minute while stirring continuously. 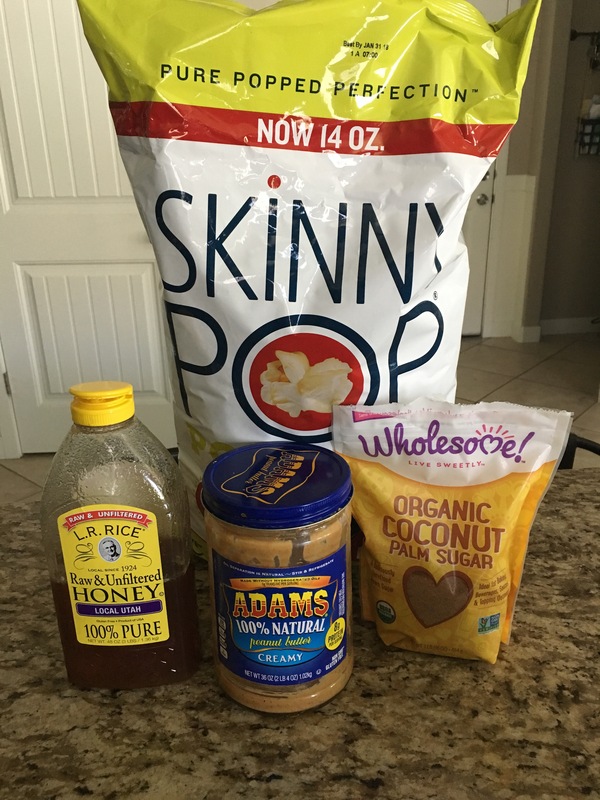 Remove from heat, immediately add peanut butter and stir until combined and melted together. Immediatley pour over popcorn and stir to combine. Enjoy!